Former Massachusetts governor and 2012 Republican presidential nominee Mitt Romney will deliver the keynote address and receive an honorary degree, with numerous dignitaries on hand, many with strong ties to the University going back decades. Those planning to attend should arrive early for a good seat, as a near-record crowd is expected for the celebration. 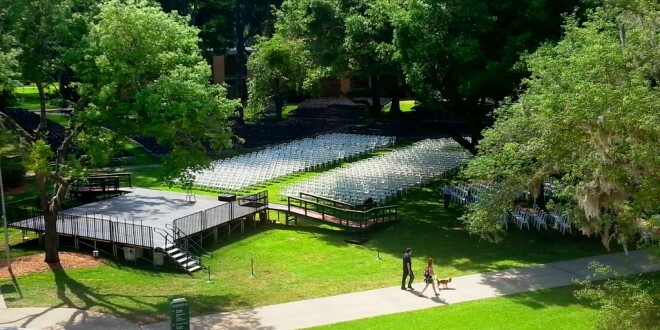 Live-streaming video of the event will be at http://www.ju.edu/commencement, and look for live updates on Twitter at @JacksonvilleU, hashtag #JUGRAD. The full original announcement of the celebration can be read here. Temperatures in the high 70s or low 80s are expected, with thunderstorms later in the afternoon, after the ceremony is completed. The University will award the first Master of Fine Arts in Visual Arts degrees in its 81-year history, as well as the first Master in Public Policy degrees ever at JU or at any university in Florida. Graduates will assemble at Historic Swisher Gymnasium at 8:30 a.m., line up at 9 a.m. and process to the iconic Dolphin Sculptures behind the Howard Administration Building, where they will meet the Platform party at 9:30 a.m. The groups will all then be led in to the ceremony by a traditional bagpiper. During the celebration, awards for scholarship and service will be given to some of the best and brightest students and faculty at JU. Capt. Herbert Hadley, who retires this May as JU NROTC Commanding Officer after four outstanding years of service, will present seven officer candidates for commissioning. A Graduation Reception is set for 4:30 to 6 p.m. Friday, April 24, at the River House on the JU campus. Students and their families are invited to celebrate Commencement during the reception in their honor. Light hors d’ oeuvres and refreshments will be served, and attire is business casual.